They say it takes 21 days to form a habit. 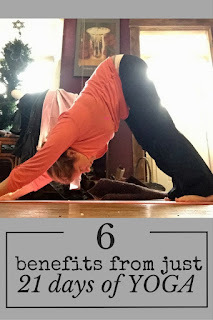 Well, I've been taking a yoga class 6-7x a week since January 4, and guess what ... I feel better. I'm also annoyed because it's not like this is a huge revelation. I'm stubborn, and I don't like it when other people tell me what to do. So hearing, "You should do yoga," would deter me for like, another year. I'd try it out on occasion, but would never commit. The good news to come out of Mom's cancer diagnosis (I haven't talked about it much on here, but if you Google "what cancer has the lowest survival rate" or "what is the worst cancer to get" you'll see what she has!) is that it has forced a lot of self-care. I'm an only child, and pretty much the ONLY downsize to being an only child is the whole being the caregiver when parents fall ill. Fortunately, I've got a huge support team of friends, and if they warned me of anything, it is to take care of myself. I am trying. The only change I've made so far is going to yoga every day. It's a huge luxury because it requires basically a 2-hour chunk of time where I need someone to watch the baby (the 4-year-old is in preschool). My sister-in-law has been watching the new wee boy. There is no way I could have otherwise afforded to pay for both a yoga class and a babysitter every day. Believe me, I recognize this privilege. Remember that I have been used to solo parenting 200+ days a year, and my sister-in-law only came to live with us in December. It's been HUGE for my ability to practice self-care. I feel stronger. I'm not quite as hesitant to carry my baby down the stairs or lift him out of the bath now. My posture is better. I still like to cross my legs and relax, but I find my spine is a little longer. I honestly feel a little taller. I am not as tired. My kids are not sleepers. The baby nurses several times a night and wakes up with teething pain or belly issues or a diaper need or just wants to party for a bit. I took my FitBit off with rage months ago because knowing that I had "374 minutes awake" was not helpful. I am not sleeping any more now than I was pre-yoga, but I don't feel as tired. This seems crazy because I sweat and pant during yoga class. But again, like they've been telling me for years ... endorphins make you feel better. I feel less stressed. Much like however many times you explain physics to me, I will never understand how an airplane stays in the sky, however many times you explain exercise in terms of neuroscience, I will never understand why it helps improve my mood. Life is intense right now, but my mind is more calm than it was. 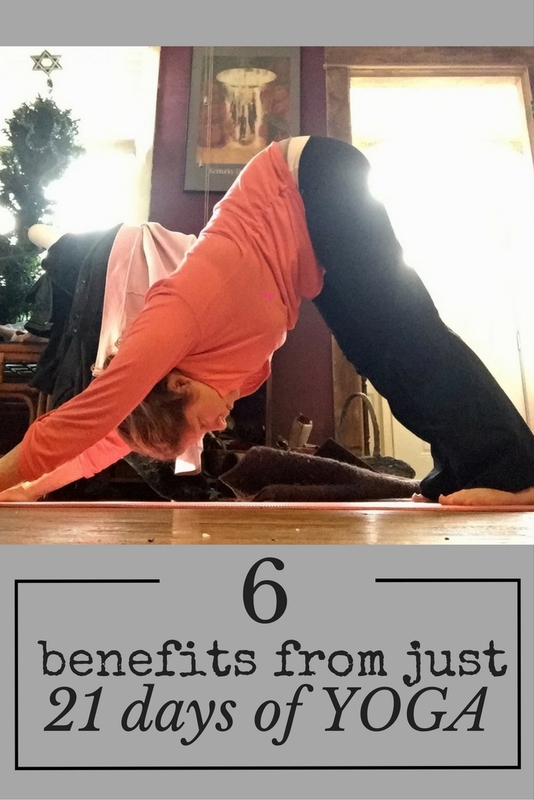 I think a huge part of it is that yoga is providing me more than just exercise: it provides that sacred alone time. I am more social. No secret that I have massive social anxiety. Going to a new yoga studio that first day was terrifying, and I still get butterflies when I don't recognize the person behind the front desk. But there is a yoga community up there, and even though I am nervous to find new community, it is good for me. I am forced to utter a few sentences every day to someone who is older than four. I'm getting there. I'm sleeping better. Notice I said I'm sleeping "better," not I'm sleeping "more." My kids still wake up at least 4x a night, and I'm nursing the baby multiple times. But most of the time I am able to fall back asleep relatively easily, which is new to me. Okay. I don't want to be a yoga evangelist, but I do want to admit when I am wrong. And for many years, I suppose, I should have been doing yoga. Oops. No time like the present, right? Now if I could just find a way to play music and write for an hour a day, I might dig my way up to zero. Weekend review: The Sound of Music & a saw gig! Wednesday confessional: I've been doing yoga. 2017: New Beginnings & Planning a Routine.